Instead it's been three trunk shows and two workshops (minus Hugh Grant). Last month the Vancouver Modern Quilt Guild invited me to a do a mini trunk show for them. I was overwhelmed and grateful by their response. They're quite a talented bunch so that really meant a lot. I was also invited to do a workshop for them on "How to Create Your Own Paper Piecing Block". It was an intense day with big brain work. You know how paper piecing is right, it's like one big puzzle. They stepped up to the plate and knocked it out of the park! We all learned a lot... and there were tacos! Everyone walked away with their own pattern block to sew. A few people were partially done sewing their blocks but Jaydeen was there first one to finish her TACO block! Next up, back to back trunk shows. The first one is today, Friday, May 11 for the Blue Mountain Quilters Guild in Port Coquiltlam at 7pm. Then tomorrow, Saturday, May 12th, there is a trunk show for the Northwest Quilters Connection: An International Quilt Group at 9:30am in Vancouver. I'm really looking forward to meeting everyone and seeing their show and tell! May 26th I'll be teaching one of my favourite projects, a Cassette Book Cover workshop for the Fraser Valley Modern Quilt Guild. It's perfect for learning paper piecing and for finishing up a project in one day. We'll aim to make three sizes but I also have an alternative up my sleeve. There are still a few spots available. It's $40 for members and $45 for non members. Email Joan jmzielke@shaw.ca to register. Hey, maybe I'll see you there! As tradition would have it... RECOMMENDED FOR YOUR PLAYLIST: I can't get enough of this band! I'd recommend ALL their songs but today I'm going to go with THE LATE SHOW by the band called The Beaches. They're a Canadian Band out of Toronto and they're killing it! Sadly I missed them in Vancouver just by days. I won't make that mistake again. Before we start I have to take a moment and give a shout out to Stephanie from @simplesewendipity who BLEW MY MIND! And then I saw her flimsy! And then I saw it all quilted up! I've made my share of cassettes in my time but Stephanie made made 28! 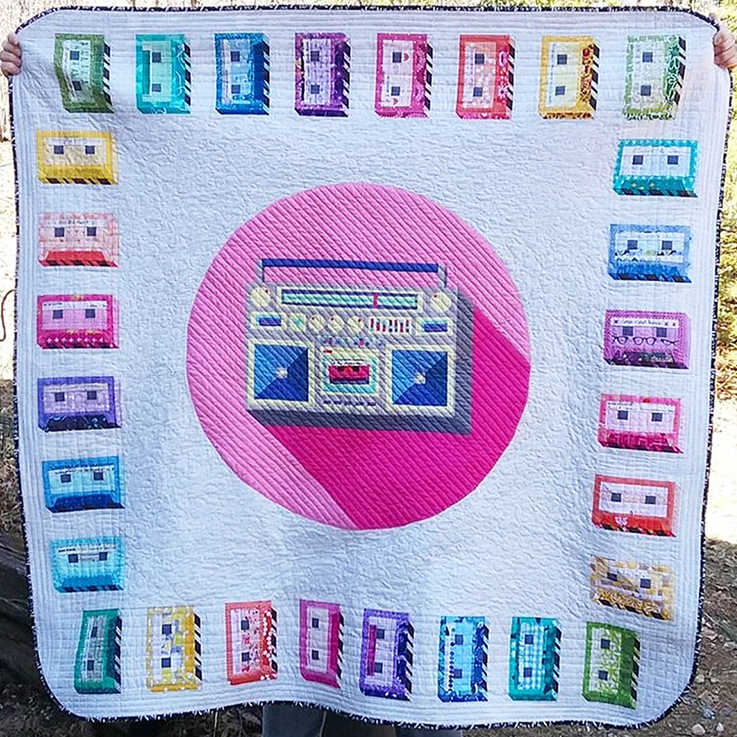 28 Rainbow cassettes to border her Boombox quilt! UNBELIEVABLE! Love, love, love! SECRET SEWING: Postponed. Do you remember a few weeks back when I told you I'd be able to reveal my secret designing at the end of the month? We're going to have to hold on just a bit longer. Oh and to really make it titillating, I've recently been working on a second secret sewing project (dream project actually!... now that I think of it they're all dream projects)! Gosh, I'm so grateful for the things that have landed in my lap. Thank you universe, I sure appreciate it! MINI TRUNK SHOW: Monday, April 16th for the Vancouver Modern Quilt Guild. I'm going to do my best Brene Brown inspired talk (gosh I love her!). Do you know her work about vulnerability? I'm going to open up and be really candid about my work and my journey on how I accidentally on purpose became a sewing pattern designer. 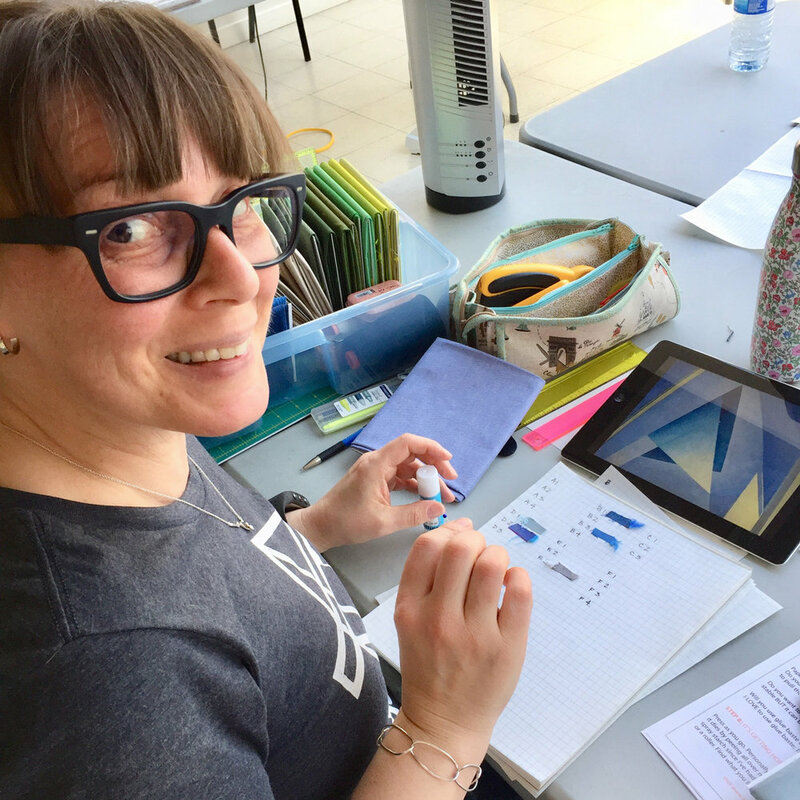 WORKSHOP: HOW TO MAKE YOUR OWN PAPER PIECING BLOCK. WHEN: Sunday, April 22nd hosted by the VMQG. WHERE: Croatian Cultural Centre, Vancouver. *There are still a few spots available-YAY! WORKSHOP: Saturday May 26th for the Fraser Valley Modern Quilt Guild. WHERE: Fraser Valley University. SHOW: VMQG Quilt Showcase. Saturday and Sunday, August 25th and 26th at the Pipe Shop (115 Victory Ship Way, North Vancouver). They put on a show two years ago (it was my very first Newsletter post on this site. You can see it HERE). It was fresh, modern and inspired. I was thrilled to have work in it last time and I'm super excited to enter work for this one too! NATALIE SANTINI : : from NOV 2017 INTERVIEW SERIES PART 1 / PART 2 : : Recently was on episode 158 of Modern Sewciety Podcast. You can listen to it HERE. It's the next BEST thing to hanging out with her in person! She always brightens my day! Oooh and she also has a new messenger bag pattern coming out soon too. Be on the look out! JENNY HAYNES : : from JAN 2018 INTERVIEW SERIES PART 1 / PART 2 exhibition at @artyfactgallery is up and it's a SMASH HIT! 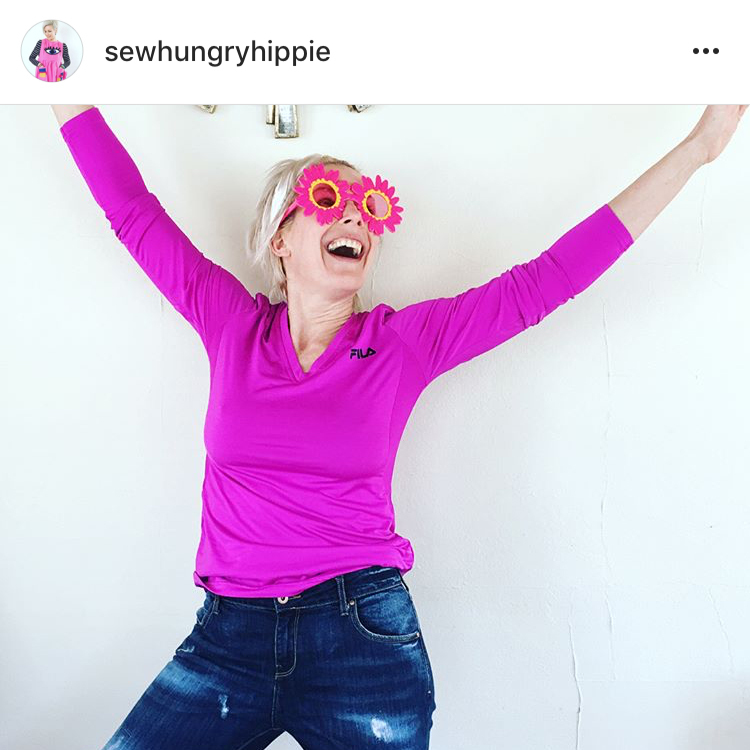 Join me in a hip hip hooray for her! ... and lastly...RECOMMENCED FOR YOUR PLAYLIST: Two song this week. A call and response if you will. Ready?... Rick Springfield's JESSIE'S GIRL (quick question Rick, why the suit?! and isn't smashing the mirror a bit extreme? It does crack me up though!) and the Car's MY BEST FRIENDS GIRLFRIEND with a lovely intro appearance by Alice Cooper!